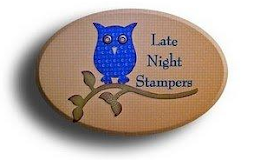 Stamping Aweigh with Norma: Congrats from my Upline! This card was made by Colleen Magness. She is my upline and mailed it to me for being one of the Top 5 in Sales in her group for the month. I love how she used the Sizzix Tasteful Trim Bigz Die from Stampin' Up for her card. Thanks Colleen!